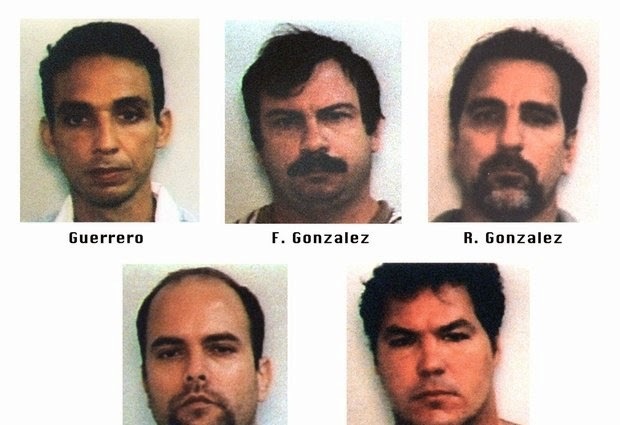 Antonio Guerrero, Fernando Gonzalez, Rene Gonzalez, Gerardo Hernandez and Ramon Labanino, who are known as the "Cuban Five." The men were intelligence agents operating in Florida in the 1990s, and were arrested in 1998 and later convicted on charges including conspiracy and failing to register as foreign agents. On Wednesday, Dec. 17, 2014, the United States and Cuba agreed to re-establish diplomatic relations and open economic and travel ties. As a confidence-building measure, Guerrero, Hernandez and Labanino are expected to be released from federal prison in Butner, N.C.
WASHINGTON (AP) — After a half-century of Cold War acrimony, the United States and Cuba moved on Wednesday to restore diplomatic relations — a historic shift that could revitalize the flow of money and people across the narrow waters that separate the two nations. President Barack Obama's dramatic announcement in Washington — seconded by Cuban President Raul Castro in Havana — was accompanied by a quiet exchange of imprisoned spies and the celebratory release of American Alan Gross, a government contract worker who had been held in Cuba for five years. The shift in U.S.-Cuba policy was the culmination of 18 months of secret talks between the longtime foes that included a series of meetings in Canada and the personal involvement of Pope Francis at the Vatican. It also marked an extraordinary undertaking by Obama without Congress' authorization as he charts the waning years of his presidency. "These 50 years have shown that isolation has not worked," Obama declared at the White House. "It's time for a new approach." Obama spoke as Castro was addressing his nation in Havana, where church bells rang and school teachers paused lessons to mark the news. Castro said that while the U.S. and Cuba remain at odds on many matters, "we should learn the art of living together in a civilized manner in spite of our differences." Obama's plans for remaking U.S. relations with Cuba are sweeping: He aims to expand economic ties, open an embassy in Havana, send high-ranking U.S. officials including Secretary of State John Kerry to visit and review Cuba's designation as a state sponsor of terrorism. The U.S. also is easing restrictions on travel to Cuba, including for family visits, official government business and educational activities. But tourist travel remains banned. Obama and Castro spoke by telephone Tuesday for nearly an hour, the first presidential-level call between their nations' leaders since the 1959 Cuban revolution and the approval of a U.S. economic embargo on the communist island that sits just 90 miles off coast of Florida. The two men are also expected to meet at a regional summit in Panama next spring. Obama did not rule out traveling to Cuba before his presidency ends, telling ABC News: "I don't have any current plans to visit Cuba, but let's see how things evolve." Despite Obama's declaration, the Cuba embargo was passed by Congress, and only lawmakers can revoke it. That appears unlikely to happen soon given the largely negative response to Obama's actions from Republicans who will take full control of Capitol Hill in January. "Relations with the Castro regime should not be revisited, let alone normalized, until the Cuban people enjoy freedom — and not one second sooner," said House Speaker John Boehner, R-Ohio. "There is no 'new course' here, only another in a long line of mindless concessions to a dictatorship that brutalizes its people and schemes with our enemies." The response from around the world was far more welcoming, particularly in Latin America, where the U.S. policy toward Cuba has been despised. Venezuelan President Nicolas Maduro called Obama's action "a gesture that was courageous and historically necessary." The Vatican said Pope Francis "welcomed the historic decision taken by the governments of the United States of America and Cuba to establish diplomatic relations, with the aim of overcoming, in the interest of the citizens of both countries, the difficulties which have marked their recent history." Even Hillary Rodham Clinton, who advocated for Gross' release as Obama's former secretary of state, weighed in, arguing that U.S. policy in Cuba, while well-intentioned, had only strengthened Castro. "The best way to bring change to Cuba is to expose its people to the values, information and material comforts of the outside world," she said in a statement. In Cuba, a sense of euphoria spread through Havana as people gathered around televisions to watch the Obama and Castro announcements. "For the Cuban people, I think this is like a shot of oxygen, a wish come true, because with this, we have overcome our differences," said Carlos Gonzalez, a 32-year-old information technology specialist. Half a century ago, the U.S. recognized Fidel Castro's new government soon after his rebels took power from dictator Fulgencio Batista. But before long things began to sour as Cuba deepened its relationship with the Soviet Union. In 1961 the U.S. broke diplomatic relations, and then came the failed U.S.-sponsored Bay of Pigs invasion meant to topple Castro. A year later a U.S. blockade forced removal of Soviet nuclear missiles from Cuba in a standoff that brought the world to the brink of nuclear war. Since then, the number of Americans who see Cuba as a serious threat has declined. A 1983 CNN/Time poll found 29 percent considered Cuba a very serious threat. That dipped to 13 percent in 1994 and 12 percent in 1997. Under the changes announced Wednesday, licensed American travelers to Cuba will be able to return to the U.S. with $400 in Cuban goods, including tobacco and alcohol products worth less than $100 combined. This means the long-standing ban on importing Cuban cigars is over, although there are still limits. Early in his presidency, Obama allowed unlimited family visits by Cuban-Americans. The financial impact on Cuba is unclear, though some American businesses welcomed the prospect of expanding into a new market. Tom Donohue, president of the U.S. Chamber of Commerce, said his organization stands "ready to assist as the Cuban people work to unleash the power of free enterprise to improve their lives." Fidel Castro's specific whereabouts weren't known Wednesday, nor was it known when he might comment on the fast-shifting diplomacy. While Obama has long spoken of his desire to open ties with Cuba, the 2009 imprisonment of Gross, an American government subcontractor, became a major obstacle. Gross was detained while working to set up Internet access for the U.S. Agency for International Development, which does work promoting democracy in the communist country. Cuba considers USAID's programs illegal attempts by the U.S. to undermine its government, and Gross was tried and sentenced to 15 years in prison. Last spring, Obama secretly authorized two of his senior advisers to hold exploratory conversations with Cuba about securing Gross' release. Over a series of nine clandestine meetings in Canada and the Vatican, the talks expanded to include broader discussions of normalizing relations. Pope Francis raised the issue with Obama when the U.S. president visited the Vatican in March. And in early summer, the pontiff sent separate letters to Obama and Castro urging them to end their decades-long freeze. The details of the prisoner releases and policy changes were largely finalized during a meeting at the Vatican last fall. Wednesday morning, Gross boarded a U.S. government plane and flew out of Cuba, accompanied by his wife and three U.S. lawmakers. Waiting for him on board were big bowls of popcorn and a corned beef sandwich on rye. "This is game changing," Gross declared in brief, emotional remarks later in Washington. He flashed a broad grin with missing teeth — lost during his imprisonment — after taking an admiring glance at the American flags posted behind him and taking note that his release came on the first day of Hanukkah. The two nations also released spies that they were holding. The Castro government released a Cuban spy who had spent nearly 20 years in prison after working for the United States and accessing closely held intelligence information at the highest levels of the Cuban government. U.S. officials said the spy was responsible for some of the most important counterintelligence prosecutions that the United States has pursed in recent decades, including convicted Cuban spies Ana Belen Montes, Walter Kendall Myers and Gwendolyn Myers and a group known as the Cuban Five. In exchange for the spy's release, the U.S. freed the three remaining members of the Cuban Five who were jailed in Florida. The men, who are hailed as heroes in Cuba, were part of the "Wasp Network" sent by Cuba's then-President Fidel Castro to spy in South Florida. Two of the five were previously released after finishing their sentences. Associated Press writers Jessica Gresko, Jack Gillum, Bradley Klapper and Ken Dilanian in Washington, Andrea Rodriguez and Anne-Marie Garcia in Havana and Rob Gillies in Toronto contributed to this report.